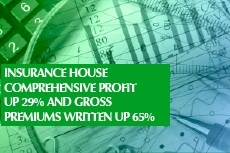 Abu Dhabi, 16 April 2014 - Insurance House P.S.C (IH) has registered a healthy Total Comprehensive Profit of AED 4.49 million during the first quarter ending 31 March 2014, nearly 29% higher than the Total Comprehensive Profit of AED 3.48 million registered in the corresponding quarter last year. Gross Premiums Written (GPW) during Q1 2014 totaled AED 38.07 million, nearly 65% higher than the AED 23.12 million written during the first quarter of the previous year. Net Earned Premiums during the quarter were up by 68% to AED 22.55 million, compared to AED 13.42 million in the same quarter of the previous year. Net Underwriting Profit after Operating expenses was AED 647K, due to pay-outs arising from higher claims compared to the same period of the previous year. Underwriting Profit from core insurance business was complemented by robust returns generated from a diversified and professionally managed proprietary investment portfolio. Income from investing activities during the reporting period soared to AED 9.26 million, compared to AED 2.45 million during the same quarter of the previous year. Total Assets as of 31 March 2014 stood at AED 265.4 million, compared to AED 254.6 million as of 31 December 2013. During the quarter, Total Shareholders’ Equity strengthened to AED 144.8 million as of 31 March 2014, compared to AED 140.3 million as of 31 December 2013. This is comfortably above the minimum required capital of AED 100 million mandated by the UAE Insurance Authority.